The Extravaganza was unique in having specially commissioned plays presented during the day. The plays were Daisy, Daisy and We all love a paddle. They reflected the park environment with a Victorian theme. There was also improvisation, where the actors responded to the events they found going on around them in the park. We all love a paddle was for parents, grandparents, and children from five upwards. It told stories of how hungry worms made the East Park lake leak, and about Lifeboat Saturday when the famous vessel the Mary Stanford was launched. Daisy, Daisy was for older folks, particularly romantics. 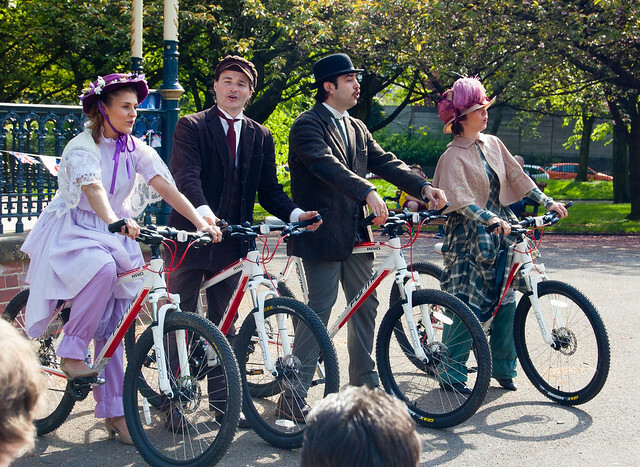 A thirty minute play, centered on the renovated bandstand, saw Ruby, Lily, Charlie and Bill challenge each other to bike races, and talk about Wolverhampton’s love affair with two wheels when its bike trade rivalled Coventry and Nottingham. The Extravaganza, held over the May Bank Holiday on 4th May 2014, was to celebrate the million-pound renovation of the park, which had been supported by a grant from the Heritage Lottery Fund.